The bold, sleek design of the Discovery™ Smith Machine features high head clearance and a clean, walk through design. The 11 degree angle and innovative Smith Bar design produces a smooth, natural feel and an exceptional user experience. In a fitness industry that is forever improving and evolving, the design of your fitness center can have a huge impact on the people who use it. With more schools, apartment & multi-family complexes, country clubs, and corporate offices building and maintaining fitness centers, the little details matter more and more in retaining and growing your clientele. Customizing a fitness experience is more than just painting the walls a certain color, it is continuous cohesion between many of the moving parts, from your equipment to your interior design. Here are a few ways that you can customize your fitness center and some examples of facilities to inspire your next project! The most widespread effect of customization in your facility can be felt in the equipment itself. From color options to custom graphics and logos, there are many choices available to you when designing your space. Virginia Tech and OSU customized their functional frames with school colors and logos, adding to the dynamic spaces. 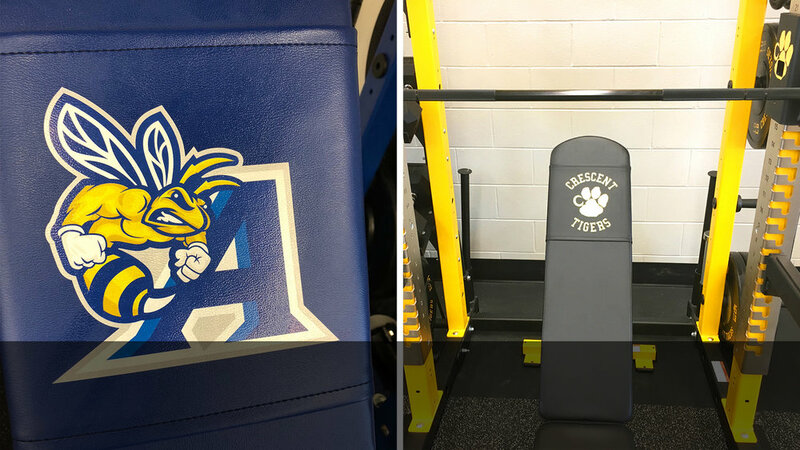 Print your logo or name on the slip covers for your weight benches to give your strength + conditioning area an added element. Allen University + Saint Mary’s SD brought school spirit into their equipment with custom color racks from Dynamic. Choose between two cardio colorways – black pearl + gloss metallic silver to give your cardio space some added color coordination. Carolina Square Apartments took their fitness center up a notch for their residents with beautiful wrapped graphics on their strength machines. What your space looks like impacts the people who use it - with the right interior design strategies, people will be drawn to use your space to it’s highest potential! Olympus Corporation motivated their employees to workout through inspirational quotes and beautiful photography - showcasing what they truly do best. 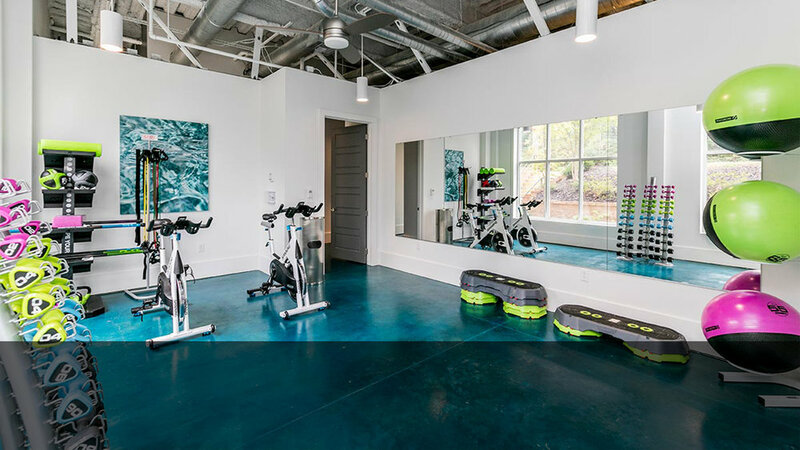 1701 North Apartments color-coordinated their entire fitness space from the studio to the fitness center. The simple use of a bright blue brightens their space up for their residents! Flooring is a very important aspect in the fitness experience - with the right flooring, your equipment and space can be allowed to shine without excess noise or high-impact stress without compromising aesthetics. 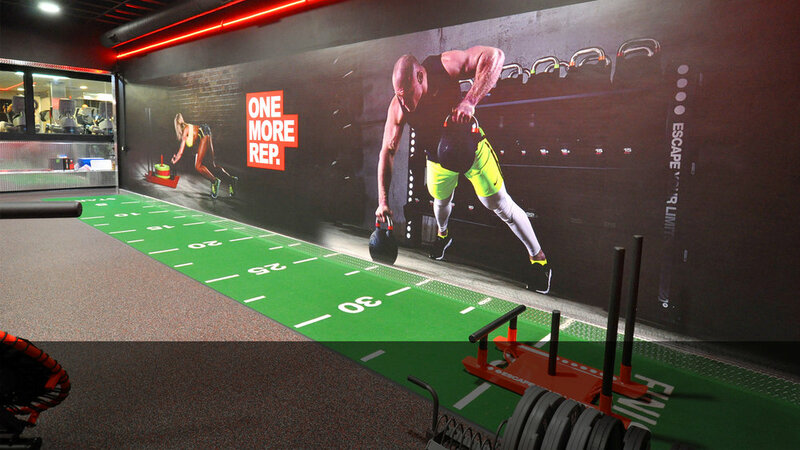 Court Jester Athletic Club created a dynamic boutique fitness experience through a variety of functional training accessories, turf lane, and motivational graphics. Ecore + Advantage worked with USC to mitigate the noise in their fitness center while also creating custom solutions to fit their vision. 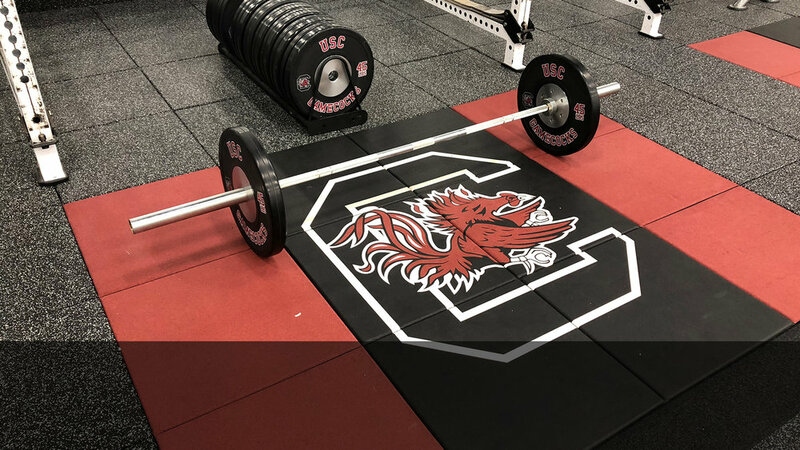 Put your logo and colors on a custom lifting platform to boost school spirit and brand presence in your fitness center. If all these other options aren’t enough, plates and dumbbells can be customized to pull every aspect together or brighten up older equipment. Hackley School provided a unique experience to their students and staff through branded UMAX dumbbells and bumper plates in their fitness center. USC brightened up their older equipment with new branded bumpers and bar ends. According to behavioral psychologists, color affects a person’s mind as well as body. Light enters from eyes and skin, travels through neurological pathways and affects the pineal gland in the brain, which in turn affects our body, mind, and emotions. There are many ways the design of a weight lifting facility can impact an athlete’s workout. 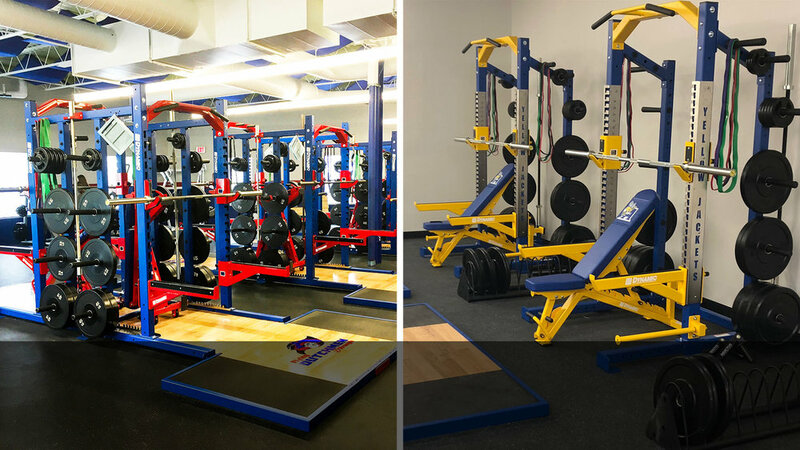 When planning a weight room build or upgrade, there’s more to consider than the equipment if you want to make the space as motivating as possible. As students return to campus, it’s the perfect time to consider how your recreation center can help keep them motivated and healthy year-round. Equipping your hospitality facility with high-quality fitness options no longer falls in the category of “nice to have.” According to a TripAdvisor survey, over half of travelers always or often exercise while traveling. There is also evidence to suggest that sub-par fitness equipment is part of the reason some guests choose not to exercise while traveling. Therefore, having quality fitness offerings could be the deciding factor between a traveler choosing to stay with you, or your competition down the street. While the ROI of hospitality fitness centers can be difficult to quantify, the true value and measure is customer satisfaction.